(Witch Doctor) This MUVE Dancing Game is called "The snake." You can check out all the MUVE dancing games at https://muve.org/muve-dancing-games/. This video highlights a Halloween Family Dance Event. Ohana MUVE is a class designed for everyone! Multi-generational exercise for the whole family to enjoy quality time together. In this all-inclusive dance class; kids, teens, aunties, parents and even grandparents can enjoy healthy physical activity together. This game is favorite for kids. Its exciting, energetic, and gets the blood pumping. Snake dances can be done with as many as 100+ people or with as little as two. The head leads the rest of the body. Dancers follow the leader loosely as they navigate throughout the room. It's important to tell everyone no to 'run' and to be very careful when encountering others. There can be several SNAKES dancing around simultaneously. (Double Dutch Bus) This MUVE Dancing Game is called "The WAVE." This video highlights a Family Dance Event. Ohana MUVE is a class designed for everyone! Multi-generational exercise for the whole family to enjoy quality time together. In this all-inclusive dance class; kids, teens, aunties, parents and even grandparents can enjoy healthy physical activity together. The WAVE is a game that is super easy to set up. You can actually play this without any floor markers at all. We all move together like a wave, all the way to the center, briefly connect with the opposite side and then retreat to the outside lines again. Two MUVE teachers on each side lead the group using Bodypart Concept Cards for movement inspiration. 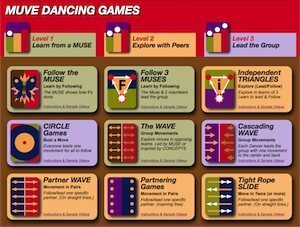 There are many MUVE dancing games you can use to ignite a fun group activity at any party. Wether you are looking to inspire your own kids and their fiends at a birthday party, or want to inspire your church group to get to know each other on a playful level MUVE has got a game for you. The game above is called "independent TRIANGLES" and can be played in it's basic form without markings. Here is how to do it: Ask your guests to form teams of 3. Then let them decide who will be the first dance leader for their team. Let the leaders raise their hands and declare that the "spots" where they stand are now called the "Leader-Spots" (Muse-spot.) Then demonstrate the "Huli Huli" rotation principle with one of the Triangle-team. "Huli Huli" means: Everybody moves one position clockwise. Now we have a new leader in the Triangle. Have everyone practice the Huli Huli rotation without music first. I find it very helpful to place a sticker at the Leader spots. I makes it very obvious who are the Muses (leaders) at all times. Cupid Shuffle gets birthday party rockin' with MUVE Dancing Game "The Wave"
Play this game to bring back the dance to the party. The Wave is a simple dancing game that can bring out the fun in everyone. Each dancer leads one movement to the center and back while the others follow loosely. "Loosely" because MUVE is always spontaneous. There is no need to be precise. It's inherently not a performance but an experience. In opposite to other party dancing games, the goal here is not to outshine or "eliminate" the competition, but to inspire others by your example. There are no losers in a MUVE dancing game. The winners are those who realize the freedom to express themselves joyfully. Fun party dancing game – Dance exercise for adults, seniors and kids. MUVE has the best dance games for parties! For a quick body shaking movement break that brings people together- try out one of MUVE's easy dancing games. No experience necessary. This game is called "Pods & Pearls" and we are playing without any dancing grid. No set up or preparation needed! Just a couple of hand towels. This game is about synergy and cooperation, how we dance while connected and how to negotiate moving as a single organism. The groups of 3 dancers connect to each other with small towels. "Pearls" refers to creating a chain that explores the space of a room, and "Pods" means dancing connected as an undulating circle. As you can see, whether your group is a 'Pod' or a 'Pearl', there are endless movement possibilities. MUVE is social interaction made easy!